World Percheron Congress 2014: Texas Thunder: The Priefert Percherons! Priefert Ranch Equipment of Mount Pleasant, Texas, is known round the world as the top manufacturer of farm, ranch and rodeo equipment. The company has revolutionized livestock handling from their squeeze and roping chutes to box stalls and walkers and fencing to dog kennels. 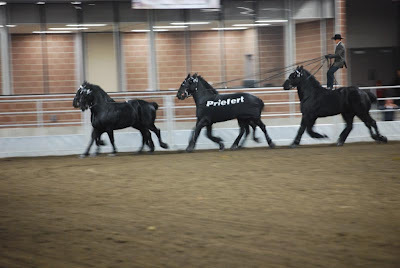 In 2002, the Priefert Family entered the Percheron fraternity when they purchased the Brookhart Lumber hitch. Shortly thereafter, they hit the road for their first exhibition in the Stevensville, Texas rodeo, and haven't looked back (or slowed down). It was the start of many good things to come. Today, under the guidance of experienced horseman and talented driver Jason Goodman, the Priefert six-up has evolved into one of the premier draft horse exhibition attractions in the country. Jason, his wife Rose, and a talented team of assistants travel from coast-to-coast with these horses performing at rodeos, fairs and major equine shows including the Wrangler National Finals Rodeo (a first for draft horses of any kind), the Quarter Horse Congress, the International Rolex Competition, several PRCA Rodeo events and more. Averaging over 240 days on the road each year, logging thousands of miles, Texas Thunder brands the Priefert name in the minds of people all across North America. In the process, they are also educating the American public about the Percheron breed. 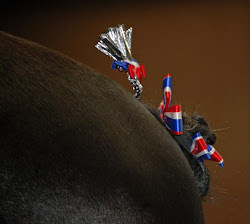 No stranger to the World Percheron Congress, the Texas Thunder exhibitioned daily at the 2006 show in Lexington, Virginia, where Goodman unveiled his newest act-Roman-riding a galloping six-up. It was an instant hit and he has been performing the feat ever since.